If there was one thing that I learned within the first five minutes of LA-based singer-songwriter Elohim's set at Webster Hall, it was that no words were going to be spoken on her end that night. Instead, the electropop musician made it clear that when she wasn't singing, she would be communicating to the audience via voice-to-text software, which would be projected on a screen behind her. As she walked onstage, wrapped up in an oversized, knee-length hoodie, we were immediately greeted by a computerized British voice projecting from the speakers, "Hello, I am Elo-heem. Please enjoy this experience." The "Hallucinating" creator stood centerstage surrounded by two keyboards, two microphones, and a mixer, which would prove to be her weapons of choice throughout the set. As she alternated between the various devices during the 45-minute show, a screen with glitchy, pulsating visuals projected behind her, illuminating her musical shift from DJ to singer to keyboardist. As I would later come to find out through more research, the latter made a ton of sense, as she began taking piano lessons at the age of five. Classically trained, hip-hop influenced, and technology-dependent, Elohim is impossible to categorize. Seamlessly flowing through songs off her self-titled debut EP, Elohim treated those in attendance to gems like the synth-driven, "Sensations" and the bass-heavy stunner, "Xanax". My personal favorite part of the performance? When she showed off her DJ chops, throwing in a filthy remix of Future's "Xanny Family" that somehow seemed right at home alongside her repertoire of electropop tunes. While many probably left with more questions than answers, I left knowing that while we might not know exactly who Elohim is (or "Elo-heem," as her digital persona would say), it doesn't really matter because her music speaks for itself. 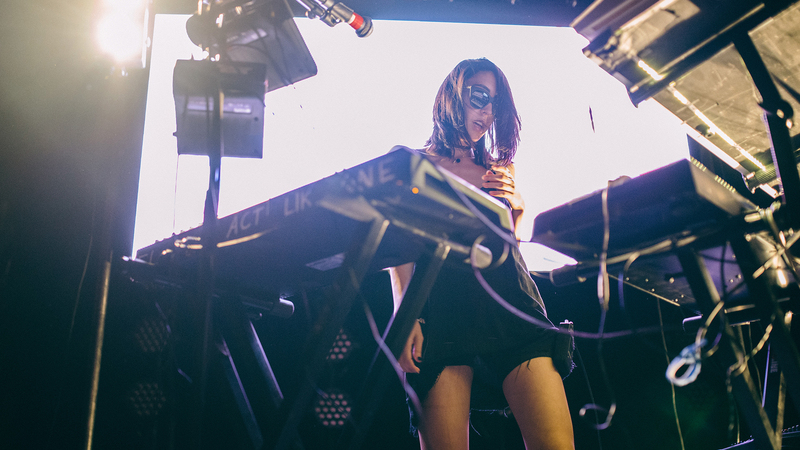 Check out our photos from the show with Irish electronic producer, Eden, below and make sure to track Elohim on Bandsintown so you never miss one of her upcoming live shows!